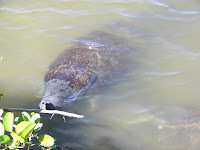 Manatees. I like manatees. Yesterday, Bill and I went down to Lover's Key. We stopped at a viewing spot and read that manatees were in the area. I told Bill how very much I wanted to see a manatee and he said look down. Just over the railing were 5 manatees! We watched them for several minutes before they swam away. What fun!